I have not been sharing some good looking female figure for quite sometime. Well here's one that caught my eye but I didn't get it. Eve is a PVC figure which was design and produced by sculptor, Daiki Kougyo. It was said that this is an original character not from any Anime or Manga. 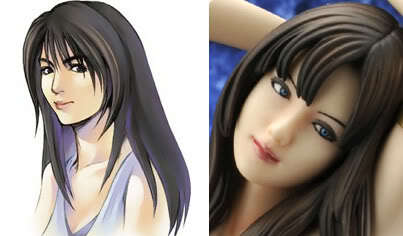 Although I personally find her resemble much of Rinoa Heartilly from Final Fantasy 8 don't you think? This figure is a 1/5.5 PVC figure which was quite rare in the market. One would have mistaken this as resin model figure due to the quality paint job and sculpting. Like most popular and high price PVC FEMALE figure, it come with removable parts. I am sure you guys would have guess what are the removable parts which is cater to the adult market. If you don't like EVE in pure innocent white, there's an alternate color version in black. Yeah, she's a dead ringer for Rinoa..
Wow! I think her body was based of a live model. This is very nice eye-catcher indeed. Yep. I am certain the creator did use a live model for reference. Hmm... pretty, but too mature for my liking. "If you are planning to get this figure, make sure you asked your Mum or any ladies in your life first. :P"
Wow! This will make good cosplay example! Ha! Ha! CHEEKY!